The Lafayette Public Library now provides free access to the member content of the Consumer Reports website! Consumer Reports is an independent nonprofit that provides trustworthy information and robust product testing in an age where online product reviews are often biased or not really written by, and for, the consumer. The Consumer Reports website provides different content than the monthly magazine. 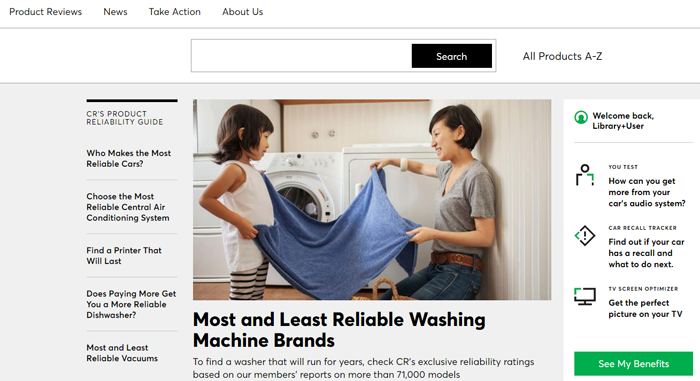 The Consumer Reports website is easy to search and browse. When you log in via the Library's link, https://cityoflafayette.com/ConsumerReportsOnline, you get full access to member features. The Library continues to offer, in addition, free access to searchable online back editions of the print magazine, as well as hard copies of recent issues that can be checked out. Links to both the online magazine, as well as the searchable database of the print magazine, can always be found under the Browse and Find - Resources A-Z menu or from the yellow Research button. ⇐Previous Active Minds Lectures: Join us in May for Brexit discussion!